Fresh raspberries set in a hibiscus jelly served with redcurrants and a vanilla custard cream. Place the gelatine leaves in a bowl of cold water to soften. Place the water and sugar in a saucepan and bring to the boil. Add the hibiscus flowers to the pan and allow to infuse for at least 20 minutes. Add the softened gelatine leaves to the pan and stir until completely dissolved. Pass the mixture through a sieve. Place a little of the hibiscus infused liquid in the bottom of your serving glasses. Transfer to the fridge until the mixture begins to set. Place a few raspberries on top of the jelly and then cover with more of the hibiscus liquid. Place the egg yolks and sugar in a bowl and whisk until pale and fluffy. Cut the vanilla pods in half and place in a saucepan with the milk and cream and bring to the boil. Once the milk and cream have come to the boil, remove the pan from the heat. Pour half of the liquid onto the egg yolk mixture and mix well. Return all of the mixture to the pan and cook over a low heat. Stir continually until the mixture reaches 82°C and coats the back of a spoon. Pass the cream through a fine sieve into a large bowl. Chill in the fridge. Add the cream to a syphon so that it is 3/4 full and then seal and charge with a gas canister. 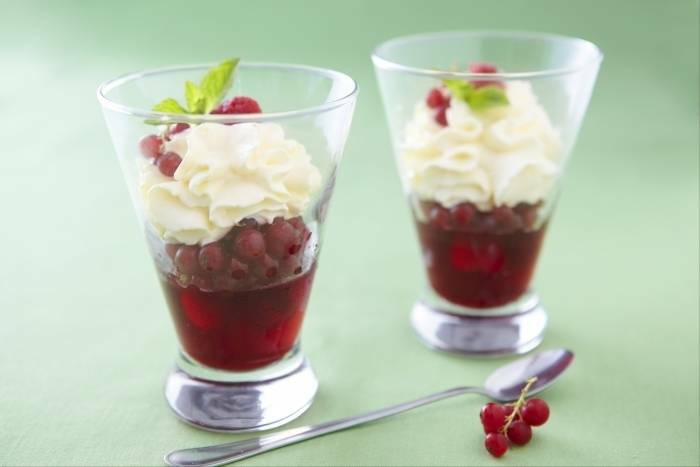 Top the hibiscus and raspberry jelly with redcurrants and finish with the vanilla custard mousse.